In addition to a healthy diet and plenty of exercise, the best juicers for greens can give your daily routine an extra hit of vitamins and nutrients! Each of the 10 juicers we reviewed here is great for making green juices, which are high in vitamins, antioxidants, and minerals – everything you need to boost energy and feel great every day! Before purchasing a new juicer to add to your diet routine, here are a few key features to know first. 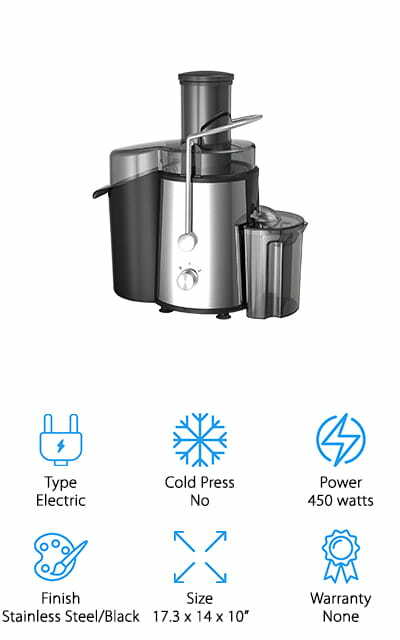 Type: Electric juicers use high-powered motors to thoroughly mash up fruits, vegetables, and greens quickly to create a lot of juice. Manual juicers are great for greens like wheatgrass and spinach, and no motor means they are whisper quiet to use. Cold Press: Cold press juicers, also known as “masticating” juicers, crush up fruit and vegetables to create juice without introducing any heat to the process. Excess heat can reduce the nutritional content of your juice and potentially affect the finished juice’s texture. 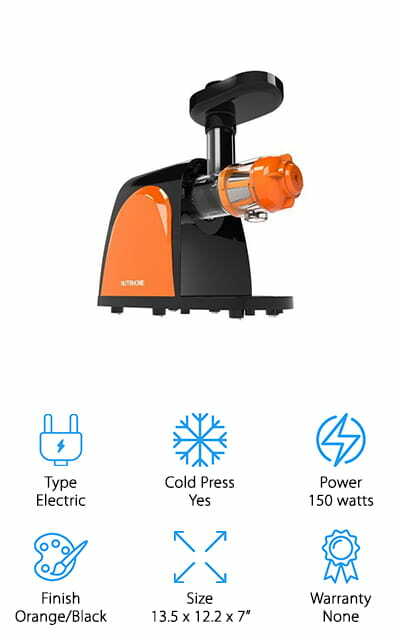 Power: Electric juicers use motors to help crush, blend, and juice, but their power levels can vary. Cold press or masticating juicers tend to use low-powered motors to reduce introducing heat, and other juicers use high-powered motors for efficiency and speed. Finish: In addition to your juicer working well, it’s nice to have one that works with your kitchen’s décor, too! We found a variety of color options and finishes, so you can choose a juicer that blends in our stands out! Size: Larger juicers are great for making juice for the whole family, and make a healthy statement on your countertop. Compact juicers are perfect for 1-2 people, or to save space by easily stowing it away in a small kitchen cupboard! Warranty: As with any kitchen appliance, a warranty is a great thing to have in case something breaks or malfunctions! It’s a good sign the company believes in the product’s quality and will do the right thing if something goes wrong! Now that you know more about the different types of juicers available, let’s get into the juicer reviews! Whether you’re looking for the best juicer for leafy greens and hard vegetables, or you want the best juicer for the money, we have one here for you! We found 10 juicers that would make a great addition to any healthy lifestyle. Short on time? Start with our Top Pick and Budget Pick now, and come back later to read the rest! Let’s start today’s juicer buying guide with our Top Pick for the best juicer for leafy greens – a multi-tasking juicer from Omega! We chose this as our Top Pick because it’s great for making healthy juices with whatever blend of leafy greens, fruits, and vegetables you like. This juicer can also do a lot more than just create nutritious juices. You can use this juicer to make nut butters and milks, baby food, smoothies, and even grind your coffee beans! The motor only runs at 80 RPMs, so everything you put into the juicer stays nice and cool by preventing oxidation and excess heat. This is great because it means the juice retains most of its vitamins and nutrients. The pulp you’re left with is dry and easy to clean up afterwards! We also like that this juicer comes with a 15-year warranty, so you can feel good about investing in this machine and using it for years to come! Next up is our Budget Pick juicer for leafy greens, which is also a great option if you have a small kitchen. 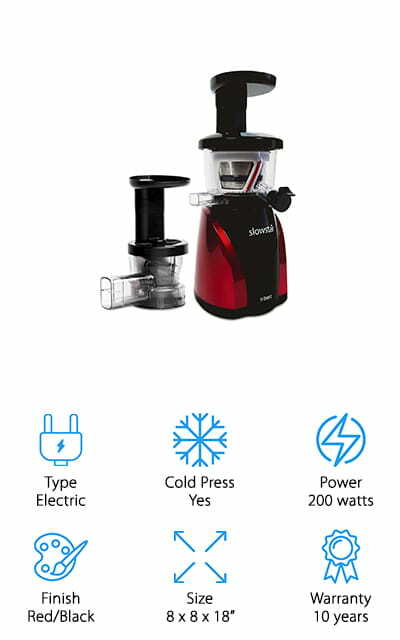 This compact juicer from Breville uses a high-speed motor and super-sharp blade to extract the most juice from fruits, vegetables, and greens to give you a healthy drink! To save space on your kitchen counter, the pulp is housed inside the machine, instead of in a separate container on the outside. We also like that, even though it’s a smaller juicer, the 3-inch opening allows you to toss in large fruits and vegetables like beets, apples, pineapple, and more. This is also the best juicer for beginners because it’s incredibly easy and safe to use. The machine won’t work unless the lid is on tight, preventing you from getting injured or making a mess if the lid comes off. It’s also easy to clean, and it’s lightweight enough to stow away in your cupboards when not in use! Our choice for the best masticating juicer for leafy greens goes to this versatile juicer from Tribest. Masticating juicers work by crushing greens, nuts, fruits, and veggies through grinders, similar to how animals chew their food to extract nutrients. 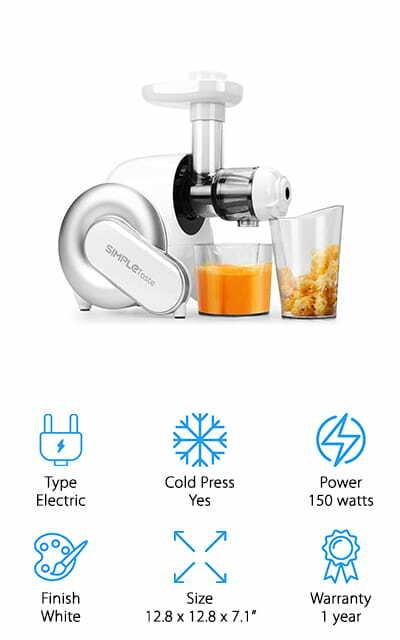 This juicer uses two stainless steel gears to mash up anything you throw into it and passes it through a fine sieve to leave you with a nutritious, vitamin-packed juice. The motor only runs at 110 RPMs, so the juices stay cool and won’t oxidize too much during the juicing process. We also like that this juicer has a reverse function, which helps to prevent clogs and jamming up the machine. It also comes with adapters that allow you to use this machine to make a wide variety of foods like nut butters, sauces, smoothies, and even pasta! Their 12-year warranty is a great assurance that this machine is built to last, giving you a lifetime of healthy foods and beverages. 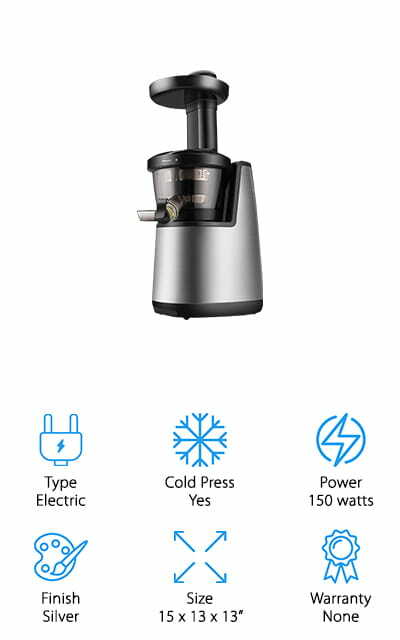 If you’d rather invest in the best juicer for green juice that doesn’t use any electricity, this manual juicer from Healthy Juicer is a great option to add to your kitchen! 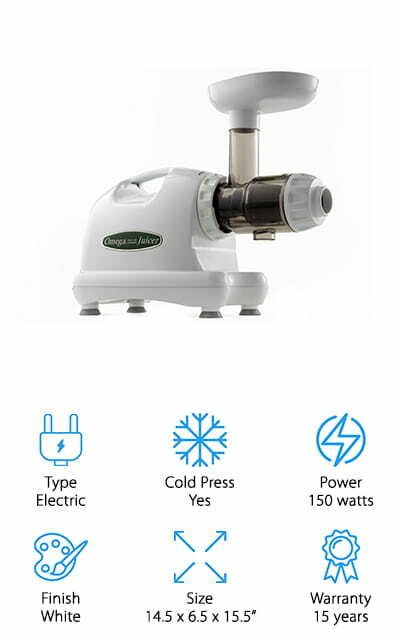 This is truly a “cold press” juicer, using no electric motors or grinders that heat up or oxidize your greens. You can press any greens you like, such as wheatgrass, parsley, lettuce, kale, chard, spinach – and much more! This press locks to the edge of your countertop with suction, and it comes with a clamp to add more stability while you juice. It comes with containers to catch the juice and pulp, along with a tool to press the greens into the machine. Everything is easy to put together and take apart for quick cleaning after each use. 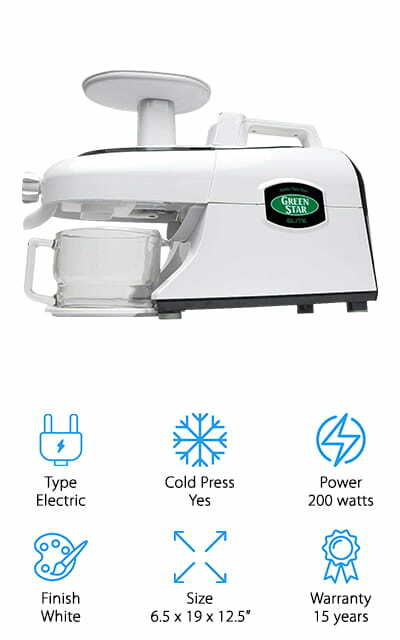 We think this is a great juicer for people who like green juices and shots every morning, or for people who want to take their juicer camping or somewhere without electricity! This cold press juicer from Flexzion is a great juicer if you want to make juices for your family each morning. It uses a masticating auger to crush and grind down greens, vegetables, and fruits to create cold, nutrient-dense juices the whole family can enjoy. It only runs at 65 RPMs, so you don’t have to worry about the motor heating up or oxidizing your hard work! The large chute and grinder allow you to make a lot of juice in a flash, making it easy to create a large batch of juice for a crowd. This juicer works just as well on leafy greens like kale and wheatgrass as it does on tougher vegetables like celery and beets! We also like that it comes with different filters, so you can control how much pulp you want in your juice! The leftover pulp is easily pushed out of the machine, and is perfect for adding to your outdoor compost pile! 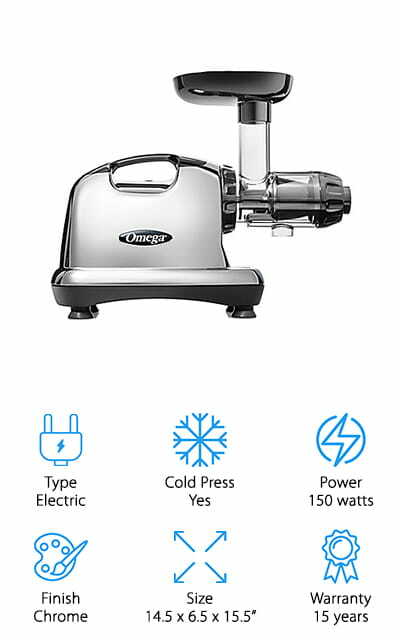 If you’re looking to invest in the best juicer for leafy greens and fruits that can also make a mean bowl of pasta, pick up this multi-tasking nutrition center from Omega! This versatile juicer makes delicious and nutrient-packed juices, thanks to a cold-press motor that keeps everything cool and fresh. You can also change up the many attachments that come with it to make a variety of other foods! It comes with 4 different nozzles to make a variety of pastas, plus attachments that allow you to make nut butters, sorbets, baby food, salsas, and more! We like that this machine is a multi-use tool, so you can buy one machine that does it all instead of spending extra money and wasting extra space on a bunch of single-use machines. Everything is also easy to put together, take apart, and keep clean, so you’re more likely to use it every day and keep it in working order for next time! This slow juicer from Tribest is a great option if you’re looking for a cold-press juicer that is whisper quiet! The slow-moving motor only runs at 47 RPMs, which ensures your juices are cold and nutrient-dense. It also reduces the amount of vibration and noise your juicer makes, so you won’t wake up the whole house with your early morning juicing ritual! The duo-blade auger mashes up fruits, veggies, and greens quickly and prevents clogs, which is nice when making a lot of juice in one go! 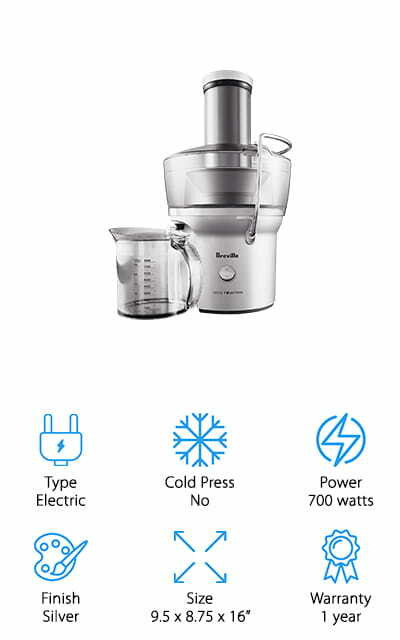 In addition to juicing, this machine also comes with a separate mincing attachment that blends and chops! You can make frozen sorbets by simply tossing in your favorite frozen fruit, or make nut butters, salsas, sauces, and pates! We think this is a great, compact machine that you can use to make everything you need for a nice, healthy brunch, or whiz up some dips, salsas, and pates for your next family get-together! On our hunt for the best juicers for leafy greens, we found this inexpensive and efficient slow juicer from SimpleTaste! This machine is quiet, putting out only 60 decibels of sound, so you can make juices in the morning while everyone else is still fast asleep! We like that this juicer slowly pulverizes leafy greens like wheatgrass, kale, spinach, and chard, leaving you with all the vitamins and nutrients and none of the pulp. It can also handle dense and fiber-heavy foods, such as ginger, celery, turmeric, carrots, and more! The leftover pulp is dry and can be added to your compost, or repurpose it to make vegetable stocks, smoothies, or nutritious snacks for the family dog! We also like that all of the parts are easy to remove without tools and clean by hand with the cleaning brush, or toss larger pieces into the dishwasher! This would make a great gift for a friend who is new to juicing! If you’re looking to save time with your morning juicing routine, consider picking up one of these slow juicers from Chefmos. While it is a “slow juicer,” it definitely makes your mornings run more smoothly. The machine itself is super quiet, so you’re not waking up everyone else in the house while you’re making your morning juice or wheatgrass shot. We also like that the chute is large, so you can save time by not having to cut your fruits and vegetables down as much. It also handles fibrous foods like celery and ginger without needing to mince them too small. The masticating auger crushes food in 3 different stages, so you get the maximum amount of juice with less fruit, greens, and vegetables, which saves you time and money. It’s also easy to disassemble and clean with soap, water, and the cleaning brush after each use, so you can have it clean and ready to go for the morning! Last up in our juicer review is this absolute powerhouse of a juicer from Baulia that can handle just about anything you throw into it! 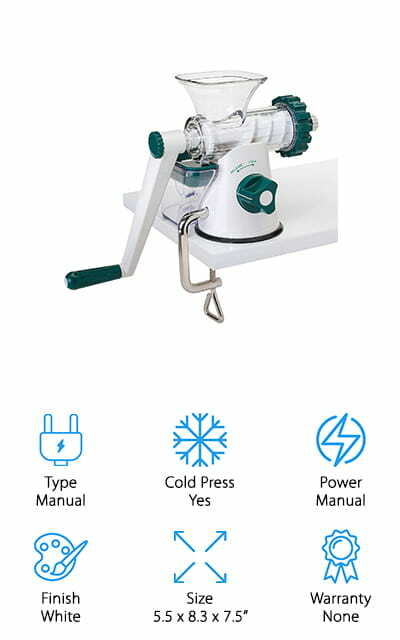 This heavy-duty juicer uses a high-speed motor to pulverize fruits and vegetables and then pushes them through a fine-mesh strainer for smooth juices. It has two speed settings, a lower setting for soft fruits and leafy greens, and a higher setting for dense, fibrous vegetables. The extra large feeder chute allows you to add in vegetables and fruits without chopping them up at all. It can easily handle a whole apple without any chopping needed! This saves you a lot of time and reduces the amount of mess you’ll have to clean up every morning! The juice is pushed into the front container, and the leftover pulp is pushed into a container on the back of the machine, which you can easily empty after each use and compost or turn into even more nutritious snacks!